Striking dark color for dramatic gardens! 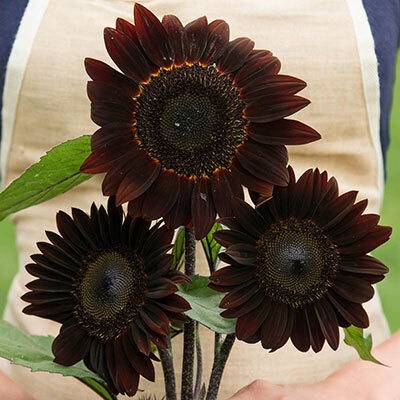 For a darkly dramatic display in the summer garden, consider adding this gorgeous sunflower to the mix. With deep burgundy-red, 4-5 in. flowers with dark centers, Moulin Rouge really stands out in beds and back borders-and are stunning in cut-flower bouquets and mixed fresh arrangements. This is a well-branched variety that bears an abundance of striking, pollen-free flowers. Moulin Rouge Sunflower grows to a statuesque 5-6 ft. tall, making it perfect for adding to seasonal back borders and foundation plantings. Easy to grow and showy, sunflowers make a great addition to any garden, and a favorite in children's gardens. 90 DAYS.